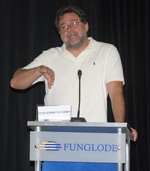 Guillermo Navarro, director of cinema photography for "El laberinto de Fauno", gave a panel titled "The Power of Image". Have you seen "Stuart Little"? ¿"Hell Boy"? ¿"El espinazo del Diablo" or "The Devil’s Backbone"? Or, more recently, "El laberinto de Fauno"? These are a few of the films for which Guillermo Navarro was Director of Cinema Photography. These were used as examples in the workshop "The Power of Image", given by Navarro at the Fundación Global Democracia y Desarrollo (FUNGLODE) as part of the first Dominican Global Film Festival, organized by FUNGLODE and its sister institution in the US, the Global Foundation for Democracy and Development (GFDD). "A picture is worth a thousand words" is a famous expression in artistic slang, and Guillermo Navarro showed it to be true in his high-level seminar. "Image is a narrative instrument that has own life and function. Beyond showing beauty, it identifies with the environment that surrounds it and with the goal of the production of the film," he explained. "The allure of film is in the creation and identification of the lens with the actual environment. Film is the product of an integrated process in which the details take care of themselves. "Film is choreography among the different elements that make it up, and photography is the face of the script". The cinema photography director explained that it is difficult to make works of literature into movies given that literary codes are often incompatible with film and many times lost in the transition. However, he clarified that works of magical realism offer more attractive visual possibilities when made into films. In a dynamic and interactive chat, Navarro explained that he does not believe that a photographer should have a personal trademark. He prefers to identify with the image according to the demands of the film. "Photography is an art that is full of subjectivity". The artist evolves along with his art. "Hell Boy", "El Espinazo del Diablo", and "El Laberinto de Fauno", which was shown during the Festival on Friday night, are projects in which special care was taken with the visual image, Navarro explained, due to environmental restrictions and the filming process. The workshop culminated with clips from "Hell Boy" and "El Espinazo del Diablo" and the affirmation that "Making movies is difficult, but it must be done".